If you find yourself struggling to maneuver around your horse barn, if you sense your horses aren’t happy in their home, it may be time to upgrade. But exactly what can make your barn a better place for you and your horses? 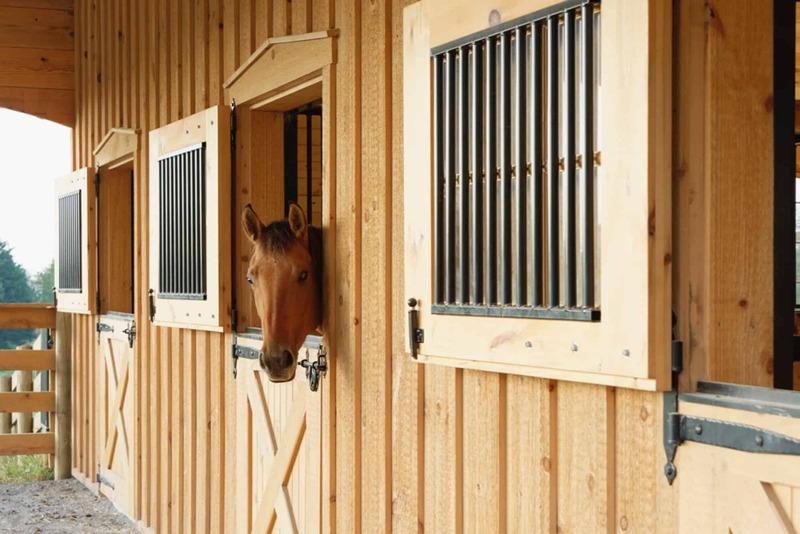 For easier maneuvering of horses, consider installing wooden or aluminum sliding doors. These doors give you more room to lead multiple horses in and out of the barn and make way for large equipment. Sliding doors eliminate the danger of swinging back, reducing the risk of injuring your horse or even yourself. Dutch doors are beneficial in some areas of your barn, as well, as they help increase the airflow in your barn. The easy open tops allow horses to hang their heads outside and socialize with one another in the fresh country air without needing your supervision. European-style stalls feature low gates, allowing horses to crane their necks and see the goings-on in the barn whenever they want. If your horse is particularly rambunctious, however, he may try to jump the low gate, injuring himself in the process. High dividers between stalls keep horses from butting heads. If you’d like easy access to your horses, whether it’s to pet and visit with them or feed them, these stalls are the perfect choice. Mesh stall doors give horses a full view of the barn. Sliding top bars can be opened and closed, giving you the option to partially open up the stalls. A bonus: sliding bars don’t block aisles, avoiding potential accidents. If you want to upgrade your stalls without replacing them, remodeling the type of bars is a great solution. Make sure your existing bars are not too wide. Bars with small cutouts or openings allow horses to safely put their heads out of stalls to satisfy their curiosity at any time. In older barns, stall walls may not be thick enough, making it easier for your horses to kick through or dent them. As you’re planning barn upgrades, now is the perfect time to check the walls and determine if they need replaced. Simple barn upgrades like strategically placed hooks on stall doors for buckets, reins, or blankets put everything within reach, making it easy for you to grab what you need to care for your horses. An empty stall can be upgraded to hold supplies like wheelbarrows, brooms, and cleaning supplies. No room in the inn for an extra stall? Fit an open space in the barn with accessories that can hold saddles, blinders, or other necessities you use on a regular basis. You want to be able to reach them easily without blocking the path of your horses. Also, be sure to stack the bales in your hayloft on pallets or tires to keep them off the ground. Other simple changes like installing ceiling fans or placing fans directly on the bars of the stalls help circulate air and keep barns cool in the warmer months. Is your barn too dark? Brighten it up with chandeliers, recessed lighting, or whatever lighting accessories compliment the style of your barn. Many types and sizes of windows can be installed in existing structures, letting more light in and allowing horses to see outside. The windows can be customized to the style of your barn to keep it aesthetically pleasing and functional. Rather than making all of these changes, Quarry View Construction can help you design a barn with all these upgrades and more to make life easier for you and your four-legged friends. With a barn built by Quarry View Construction, you know your horses will be comfortable in their environment and you’ll have plenty of space to care for them.